Ceiling decoration is a very important consideration, whether you are redecorating or designing a new house. You should ensure that every part of your ceiling has a festive touch when decorating it. Are you wondering what you can do to your ceiling to add a touch of beauty? 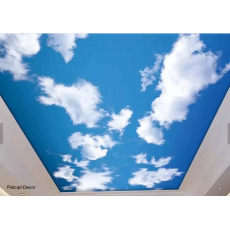 Sky ceiling mural is a great way to create a focal point on your ceiling. A beautiful ceiling mural that will completely transform your house, office or restaurant. By installing decorative ceiling mural, you will add depth to any room quickly and easily. These murals are made of high quality material which is durable and wipeable. Need to transform your ceiling and you are wondering where you can get luxurious ceiling murals? Petcarl-Décor.co.ke is a reliable place where you can always visit to buy what you are looking for. You will obtain quality ceiling mural from Petcarl-Décor at a very affordable price. Try us today and you will be impressed!